"Organize your time with notes!" 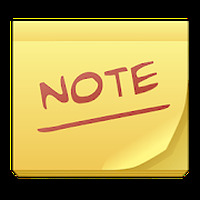 App description: ColorNote is a simple app in which you can write notes to create reminders or important lists. Functions: With it you can have a quick and easy experience when editing notes, reminders, emails, messages, lists and more. Activities: Organize notes by color, use color with notes widgets on the home screen, mark completed / finished items in a list and protect your notes with password if needed. How to use: Working as a text editor, the notepad option lets you save as many characters as you want with your device's virtual or physical keyboard. After saving, you can edit as desired. Installation requirements: A minimum of 1.04 MB of free memory space and Android OS which Varies with device. Rating: The TOP 5 Most popular Apps in Notes Organizer category. Ranking: The TOP 5 Most downloaded applications in Notes Organizer category. An amazing notes organizer for smartphones. Reminders in the notification bar. Backup your notes on the memory card and online. Provides only a few functions. Do you like ColorNote Notepad Notes?